Cheryl Stebbins grew up in Phoenix, Arizona, and currently lives in Villa Hills. She earned her degree from the University of Cincinnati with a Bachelor of Science degree in Nutrition. 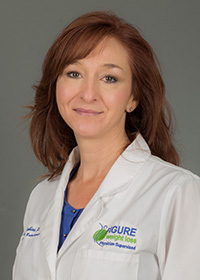 Her dietetic internships include St. Elizabeth Healthcare and Cincinnati Children’s Hospital working with varying medical conditions, including bariatrics, renal, gastroenterology and cardiology. Her approach to helping our patients reach their health goals is through nutritional education and support.